The Sorting House is a remarkable new residence where living spaces flow. The large footprint of the original Post Office building offered the opportunity to create uncommonly spacious and flexible residences from lofts to duplex penthouses with generous outdoor spaces. On the fourth floor, duplexes flow from an open kitchen at one end to a contiguous great room that opens onto a 600 square foot private terrace. Concealed by millwork, a storage/flex space beneath stairs and a walk-in pantry allow for a clutter free living space. The fifth floor includes bedrooms, abundant closets—including a walk-in closet—with two of the rooms featuring oversized casement windows overlooking the unit’s terrace. Great Rooms flow out to terraces rivaling the size of the adjacent interiors, creating generous living spaces and fluid areas for entertaining. Roof terraces are exquisitely detailed with built-in wood banquettes and planters. A dramatic interior staircase leads to bedrooms and bathrooms on the upper level. Both floors have south facing windows. 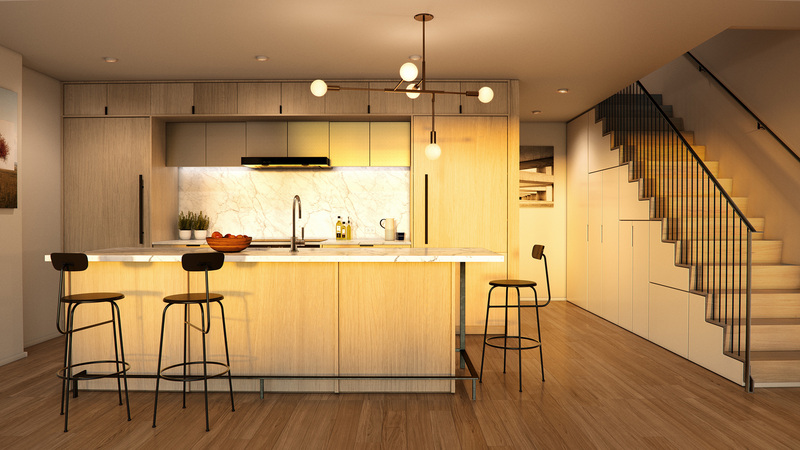 On The Sorting House’s top floor, the generous layout of the Penthouses includes a large open kitchen, dining, and living space, and two or three bedrooms. An atrium-like internal staircase provides direct access to the private rooftop patio. Natural wood deck detail, banquettes, planters, and screens create an inviting, private outdoor space. Penthouses are distinguished by their spacious layouts that internally connect via stairs to private roof patios. Located on the third and fourth floor, lofts range from one to three bedrooms, with ingenious flexible design incorporating gliding walls, sliding doors, and flex spaces that can be elegantly tucked away. Open kitchen spaces extend into the great rooms, and gliding walls transform spacious foyers and bedrooms into private spaces. With the gliding wall retracted, lofts provide over 80 linear feet of contiguous wall space— ideal for an art collection. Loft units with gliding walls allow the great room to be bifurcated into separate living and sleeping areas. The gliding walls allow residents to effortlessly convert a large gallery-like loft space into a separate living area and bedroom—either daily or permanently. Ingeniously designed to visually integrate with the space, the architect-designed walls disappear into a pocket wall or glide out along recessed ceiling tracks to divide the living space. The walls’ superior craftsmanship and sturdy construction includes a passage door for communication between the spaces that blends into the wall. The architects also designed custom hardware pulls and locks for the system. 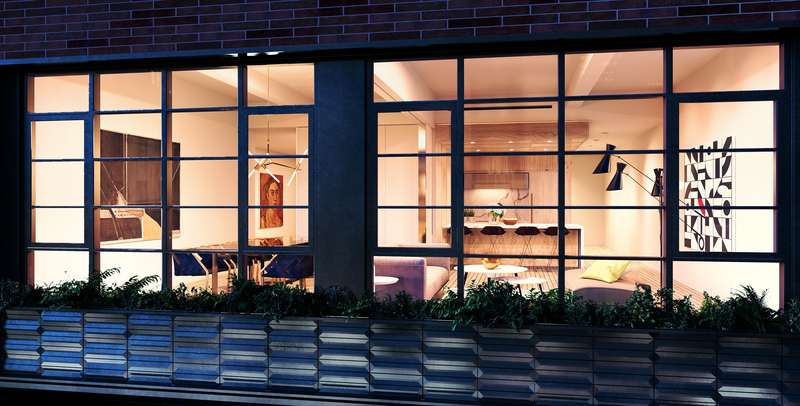 Oversized operable casement windows, dramatically framing one end of the lofts, flood the spaces with light. 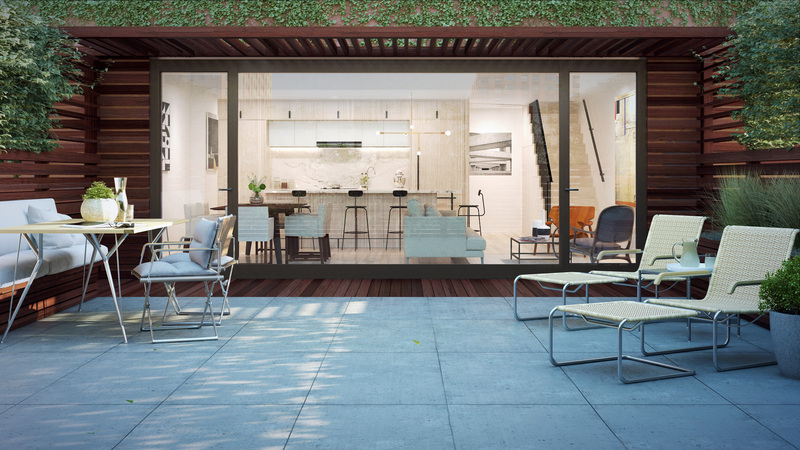 A private rooftop patio exceeding 220 square feet is dedicated to each loft. The interiors are characterized by a refined minimalism of clean lines, elegant finishes, and natural materials that flow throughout the residences. Custom White Oak millwork envelops kitchen appliances, cupboards and islands for a sleek look. Delicately veined Italian marble slabs compose countertops, backsplashes, and custom island tops. The chef-quality kitchens have recessed downlights and under cabinet lighting for a professional environment, and are appointed with Watermark faucets, Miele appliance packages including state-of-the-art induction cooktops and hoods, as well as under counter wine coolers. Select units have walk-in pantries with custom storage shelving systems. 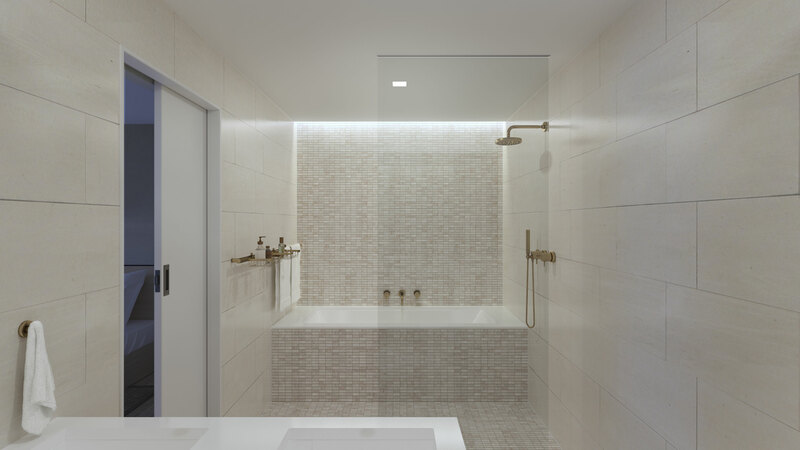 In keeping with the aesthetic minimalism of the residences, the Master Baths, Second Baths, and Powder Rooms are all detailed with stylish European-inflected fixtures and finishes. Each incorporates its own subtle yet indulgent selection of materials. The spacious hospitality-inspired Master Bath has a tranquil palette of natural stone mosaic floor tile, limestone wall tile, limestone slab counters and surrounds for the Kohler soaking tubs, all accented with aged brass Watermark fixtures. A custom railing system, designed by Architecture Outfit, ingeniously hold towels as well as hooks and storage containers. The Secondary Bath features a warm slate colored stone mosaic floor tile, porcelain wall tile, Kohler soaking tub, and polished nickel Watermark fixtures.